I was standing in the tile store buying tiles. 4. 4 tiles. I smiled because I thought "A-ha!" This year there would be no shopping in the mall wondering if our brother-in-law Matt liked brown gloves or black. Would my husband's sister like relaxing lavender bath gel or refreshing peppermint? No, this Christmas we were going old fashioned. We were going homemade. I love my husband's family. In the in-law department I lucked out. Big. They're smart, funny, witty and most of all they love us and we love them. A week living in a house together on Martha's Vineyard is too short. So at Christmas, we all really want to show each other we love you which is why we end up at the mall wondering what gift could show them "You are the absolute best sister/mom/father we could imagine. We love you." In the past, we picked names and while the little girls in the family always got presents the adults draw one name to buy for. Still, though, what do you buy someone who really doesn't need anything? Which as a family, thanks to my mother-in-law's brilliant idea, we were going homemade and we would be making a Christmas present for one couple. Names were picked and we got L.'s sister Carolyn and her husband Matt. I was excited. At dinner one night L. and I talked about what we can make together as a craft. L. and I were going to be Martha Stewart. "Oh! How about a paper mache of their house!" I thought about their beautiful home on the lake. "You could make the house and I can do the dogs and cats!" L. stared at me blankly, fork of Chicken Piccata raised in midair. He started laughing. "I have no idea how to make a paper mache house. Do you?" he asked. "No idea," I said. "Hmmm, and it's probably not practical. Who really has room for a diorama of their house? If they want to see what their house looks like they could go outside, hunh?" "Good try, though, honey. Maybe you could start with a paper mache of an egg or something." L. smiled at me. "Or maybe you could send them Chicken Piccata. This is amazing." "Oh, I got it. I got it. I got it. I GOT IT!" I ran out to the garage. I came back to the table holding a single watery aqua and blue rippled tile. I held it front of him. "LOOK! This is what we're making!" "No, silly! We're making them coasters!" L. looked from me to the tile. "Coasters? It's a tile. For a bathroom. A pretty bathroom, but still a bathroom." "No, no!! Look!" I held up the tile closer for him to see. As if that would help him 'get' my idea better. 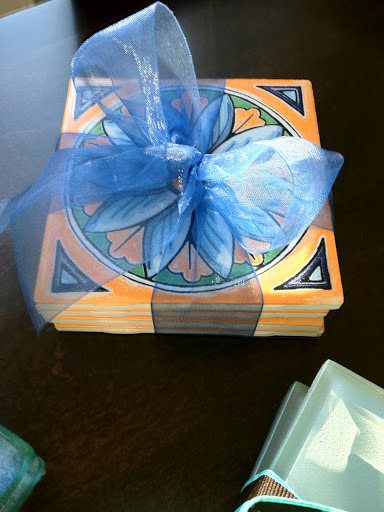 When we were remodeling our bathroom last year I had seen this blue tile in the specialty tile store and fell in love. They were special order from Italy and so impractically expensive I only bought one small box of 12 tiles. We had gone with the more practical 16 by 16 limestone tiles for our bath but now we had a box of pretty blue tiles that I liked to run my fingers over. It was like touching the Mediterranean Sea. L. looked at the tile. "Right. Coasters. OK. Good. But maybe send them this Chicken Piccata too." I mulled over the tile the rest of the week, turning it over, feeling the coolness of the glass. Then it dawned on me that this color isn't THEIR color. It's ours and while we may love this color, this is supposed to be about them. I realized that if I could make a coaster from this pretty blue tile then I could make coasters from any tile. The next morning I went to Lowe's and the specialty tile store. There are literally hundreds of types of 4x4 tiles to choose from that you could buy right off the shelves from glass to marble and limestone. There are glazed ceramic tiles and classic glass tiles in shades of blues, reds, yellows and greens. I picked up several different types, including limestone that I knew would be perfect for Matt and Carolyn's home. Then I hit our local craft store with the tiles and picked up supplies I'd need to make these tiles into functional, stylish, personalized coasters. 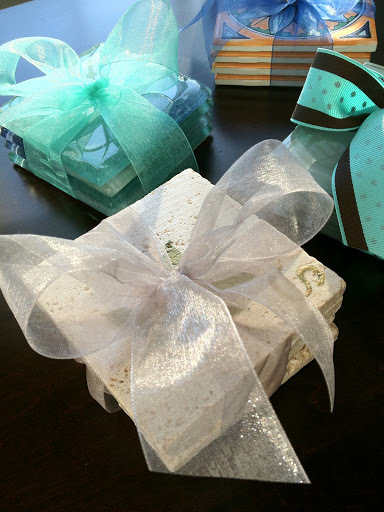 I tried several different methods and it turned out to be a simple, frugal, fun project. You can make a simple set of 4 classic glass coasters in under 30 minutes. Personalized stone coasters can take about an hour depending on how artistic you are. I created several different prototypes and the glass coasters look best when left as they are. Paint tends not to adhere well to the shiny glass. In fact, I used one of my glass tiles as a paint palette and the paint peeled right off when I was done. Limestone tiles were perfect for painting. Prepare your work area by laying down a protective surface. 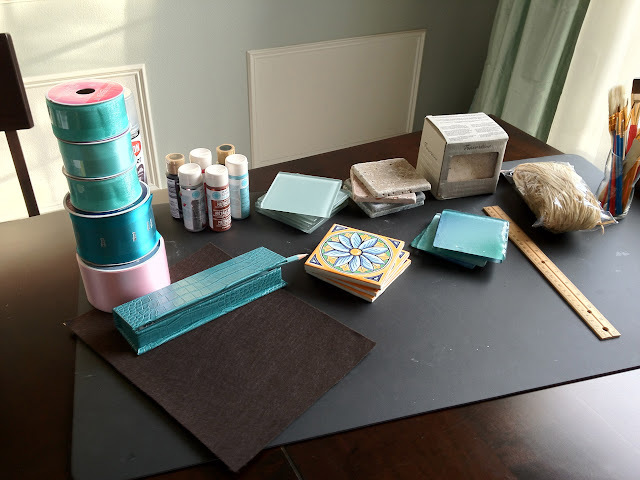 For crafts, I found that a cushioned protective desk mat from Office Max works great and will save your table from scuffs. Set up your work area with your supplies. 1.) Take a piece of the sticky backed felt and place on the table felt side down. Place your tile in a corner of the felt so that both one side and the top of coaster are offset from the felt by a 1/4 inch. You don't want the felt to go all the way to the edge of the tile. Use your pencil to draw the outline on the paper backed felt. 2.) Cut out the felt square and use the square as an outline to cut out three more felt squares. 3.) Wipe off back of glass/ceramic tile of any dust. Peel off backing of felt and adhere felt to the back of the coaster. Do this to the other tiles. 4.) 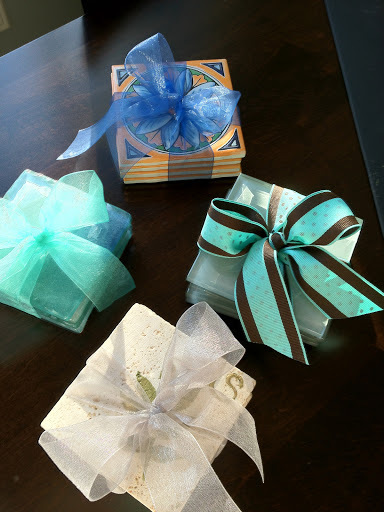 Wrap a ribbon around the new coasters. For personalized tiles, it's a little more work but still an easy craft. 1.) Set up an area with craft paper or newspapers. This is going to get a little messy. 2.) Using a damp cloth, remove the dust from the stone tiles. Line them up side by side. 3.) If you are creative, you can draw an initial or a picture freehand or use a stencil. I did both. To stencil, lay the stencil over the tile. Pour a little paint in a small bowl or plate and using a stencil brush, dab the paint over the stencil. Remove stencil. 4.) Let paint completely dry then either paint the clear laquer on each tile or take them outside and spray each one. I tried both methods and they worked equally well. 6.) 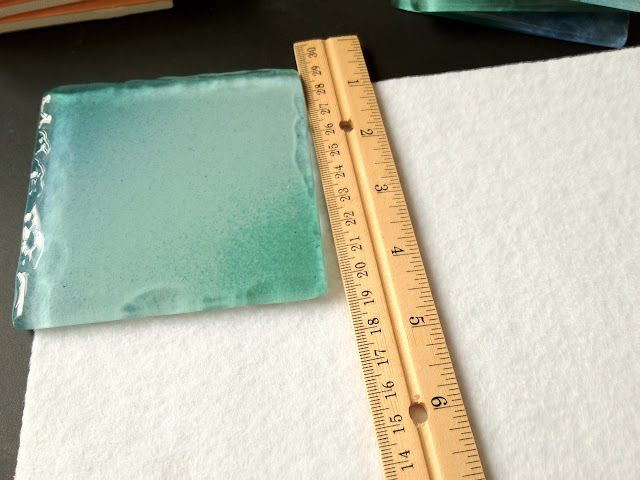 Turn completely dry tiles over and apply the adhesive felt to the backs as you did for the simple glass coasters. Make coasters for a coffee lover and include 4 coffee mugs and a bag of Dunkin' Donuts coffee. Including Chicken Piccata is totally optional.